For crust, in a small bowl combine cracker crumbs, pecans, or walnuts, flour, and the 1 tablespoon sugar. Stir in the melted margarine. Toss to mix well. Press mixture onto the bottom and up sides of a 9-inch pie plate. Bake in a 375-degree oven for 8 minutes. Cool on a wire rack. For filling, in a medium saucepan combine the 1/2 cup sugar, cornstarch, and gelatin; stir in milk. Cook and stir till thickened and bubbly; cook and stir for 2 minutes more. Place sour cream in a medium bowl. Gradually stir milk mixture into sour cream; stir in vanilla. Cover and chill for 1 hour, stirring once or twice. Stir berries into sour cream mixture. Turn filling into cooled crust. Cover and chill at least 6 hours or up to 24 hours. 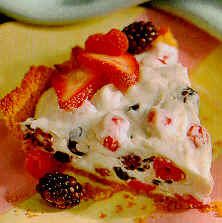 If desired, garnish with additional berries before serving.